As I've gotten older, it's funny how my tastes have changed a bit. I'd say I'm still pretty funky/eclectic, and I still hate spending money - but I've come to appreciate some of the nicer things in life. And that's true both for myself and when looking for gifts for others. Hubby's never been incredibly materialistic anyways, but when I do get a gift for him, I always put a lot of thought into it, because even though he'll truly appreciate anything I give him - I want him to really love whatever it is. But hubby also enjoys unique things, so I was able to gift him with something that was the best of both worlds - both thoughtful and unique. 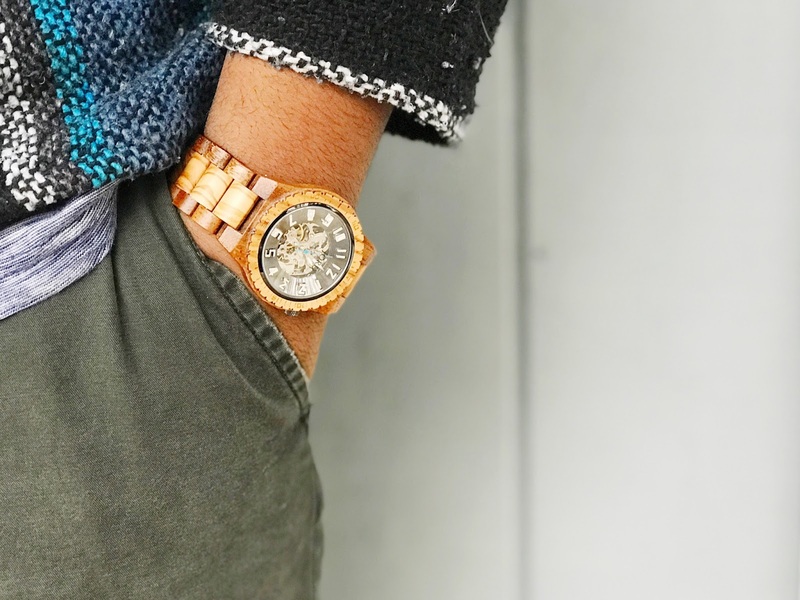 Wooden watches have been slowly gaining popularity for the last couple of years, and Jord offers a selection that is truly beautiful, and they even sell Apple Watch bands, which is something that impresses me, because I'm an avid Apple Watch wearer, so that's something to consider for myself. For Andre, I went with the DOVER series in olive & acacia. I love the combination of lighter and darker woods, and the dark steel watch face. I also really love that the watch is automatic - which means no battery is needed. I know I, for one, end up stopping wearing a watch because the battery has died and it feels like too much trouble to change it. We have already received so many compliments on his watch. Each watch is custom-sized, but when I ordered hubby's, I gave the incorrect wrist measurement (oopsy!). I didn't want to risk destroying the links, so I took the watch to get resized and everyone in the shop was obsessed. And Andre's reaction, you ask? Let's just say he freaking loves it! 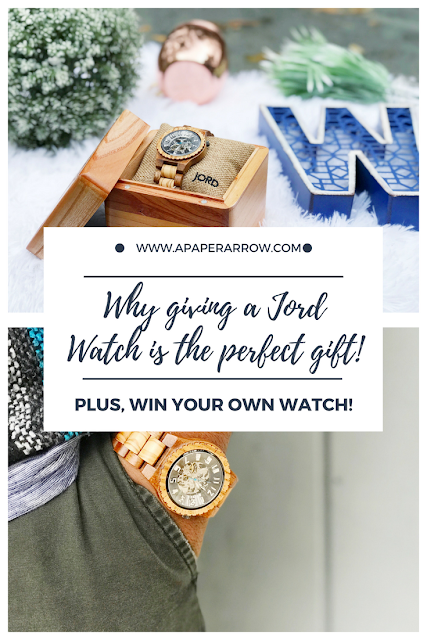 A watch or watch band from Jord is a perfect gift. Available for men or women, there's an option for pretty much anyone (except those folks who literally just never wear watches). Each watch comes in a matching wooden box, complete with a finishing oil to take care of your watch, and there's even a little drawer in the bottom to store it. Seriously, though. These watches are gorgeous and you can win one for yourself (or to gift!). 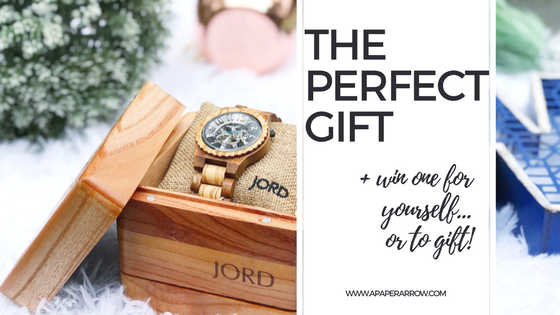 Enter below for a chance to win a gift code for your own Jord Watch. To enter the giveaway, click here. *The giveaway winner will receive a $100 gift code to use towards a Jord Watch, plus FREE SIZING and FREE SHIPPING. Click here to enter. Plus, all readers can also use kaylakedavra to get $25 off a Jord Watch purchase right now! Giveaway is open for two weeks. $25 coupon code can only be used during the giveaway period. Which watch would you select if you win? Thanks to Jord Watches for providing a watch free for review and for sponsoring this giveaway. All opinions expressed are, as always, 100% my own. Books are my favorite! And I agree - the wooden watches are gorgeous. Yeah - there are some incredibly gorgeous ones!